Author : Robert P. Moses Charles E. Cobb Jr. The Algebra Project is a noble and worthy enterprise, even if it hasn't led to the radical transformation in education that was still hoped for at the publication of the book.First, however, even with no math content or research into pedagogy, this is also simply a good report of the author's experiences in the struggle for civil rights.That he turned that experience into a revolutionary attack on the structural racism embodied in the U.S. school system is what drove this book, though, and on that it should be judged.There, the message is split.Moses and his Algebra Project (AP) showed that student-centric participatory learning was a viable way of educating, even with something as semantically dense as algebra. This approach, broadly speaking, has gained many adherents and now forms the primary methodology some mathematics teacher education programs use.There are two key differences, I think, although I'm basing my assessment on this book and its appendix, not on any examination of the curricular materials.It seems Moses discovered the AP's students could create their own curriculum once he had provided an adequate set of framing questions. That's great; this is what is now taught.But one problem might be that he decided to use that student-create curriculum as a model, leading subsequent cohorts of students to re-use the same methods and terminology — at least that appears to be what the Appendix suggests. This curriculum was adapted for different regions (Mississippi had different landmarks than Cambridge) but appears to have been seized upon as a "better" student-created curriculum which later cohorts were nudged towards.The second problem appears to be the substantial distance this student-created effort ended up from standard mathematical practice, leaving the students forced to also learn to bridge their own concepts back to those all other math practitioners would be using.The equivalent techniques we're using today use the student-centric participatory model to engage students in "authentic" exercises that trigger their own latent curiosity, but a later part of each lesson plan (a few days or so later) would be to introduce "standard" terminology and practices, reminding the students that mathematics, like any language, is useless unless it can be reliably used to communicate with others. Once students have adequate mastery of the concepts and their usage in standard practice, the next lesson begins the cycle anew with a new participatory phase.There is, unfortunately, a second explanation for why the Algebra Project didn't continue its steamroller successes and take over mathematics education. It is possible that many of the positive effects were due to the Hawthorne effect, or a variation thereof. As Moses makes clear, the children targeted by the Algebra Project were terribly neglected by the education system. They were possibly so hungry for care and attention that almost any respectful attention paid by adults may have resulted in positive outcomes. The sense of community fostered by the Algebra Project and the Young People's Project undoubtedly also helped.Those effects shouldn't be discounted, and the second should always be fostered as a motivation for learning. But as the excitement wore off and more schools began to teach this curriculum simply as a curriculum, without the charismatic leadership and exciting sense of community, it lost much of its appeal. My rating for this book isn't a rating of the Algebra Project itself. I think what Robert Moses did during the civil rights and has done for education is courageous, inspirational, necessary, and yes radical. He is doing very important work that is now really being brought forward by Common Core Standards. However, this book was a tough read. I had a lot of trouble with the asides from various other people throughout all the chapters. First, it wasn't clear sometimes who was commenting and it really made the chapters and book as a whole feel disjointed and confusing. Also, when he recounted his days in the civil rights movement I had a hard time following what he was talking about because he never really talked about the results of his actions. This may have been intentional because I think he intended that part of the story as a description of tactics that he applied to the Algebra Project, but I was disappointed to not get closure there. A similar problem happens in his description of the Algebra Project where the narrative jumps all over the place and recounts very similar stories just in different areas. I'm not sure the repetition was necessary. I did enjoy the appendix explanation at the back of the book with the example problem, but that was the one concrete example of the type of teaching they are doing in the book. I would have loved to read more of that. This is a great project, but I'm not sure that this book is its best advocate. One of the most important figures of the African American Freedom Movement during the 1960s, Bob Moses redirected his energy to the battle for mathematical literacy, especially among black children, raising all kinds of puzzled responses. Radical Equations is a clear chronicle of the logic linking the two parts of his life and a useful resource on the part of the Movement--the most important part--that focused on ordinary people organizing themselves, and often becoming local leaders in the process. It's not a great read in part because Moses spends way too much time quoting people about the importance of the Algebra Project, but it's worth reading for its commitment to an approach to education that takes the voices of students absolutely seriously and envisions a path to preparing students to survive in a technological world. Published in the early 2000a, its perspective on both technology (which Moses champions) and the political pressures on schools are a bit outdated. Not quite what I was expecting. I appreciated to first half of the book which chronicled Moses' involvement in the Civil Rights Movement in the 60s and understand the desire to give a nod to everyone who took part. However, the sheer number of names that piled up made it difficult to follow the narrative. This situation was even more evident in the second half of the book dealing with the Algebra Project. I was also hoping for an emphasis on the math, rather than on the administrative history of the Project. Thank goodness for the appendix. The entire book was well done. Linking the civil rights movement and the Algebra Project made a powerful case for a math literacy movement on the same level. The break down of the civil rights movement, mentioning people who have been lost in history classes was fascinating. I slowed down a bit when Moses started talking about the history and application of the Algebra Project, but the discussion of how it inspired students to speak out for themselves was engaging. I liked the story and the history. some parts are difficult to read through due to word choice. My biggest issue, however, is that I wanted to know more about the algebra project pedagogy and the discussion is reserved to the appendix. As a middle school math teacher I really wanted more information on how he actually teaches these concepts. I came to this book as part of research on the contribution of Ms Ella Baker to the civil rights movement as well as the role of radical pedagogy in the struggle. As a lead organizer in the Student Non-violent Coordinating Committee, Moses occupies a special in telling the story of the Mississippi campaign. This book intriguingly weaves together Moses's remembrances of that time along with a thorough introduction into the history, ideas, and practices of the Algebra Project. Published in 2001, the sections on Moses's Algrebra Project focus mostly on the '90s. Moses is someone who has dedicated his life to organizing and the role of education in movement building. The book seems to have the singular purpose of providing a context for the Algebra Project as a continuation of the struggle in the 1960s. Moses - along with his co-writer, Charles Cobb, Jr - does a great job anticipating those critics who might find it difficult to make that connection. He also gives a useful summary of the basic methodology of the AP. These sections come across as especially exciting when considered in the larger framework of radical pedagogic projects. The method sections are written in a way to address the skeptics. In this sense, the book seems very much targeted to those education professionals (from mathematics, in particular) seeking to find out more about the AP and how it straddles the obligations of math curricular requirements as well as the larger values of a radical learning initiative. Readers less inclined to pick up the book for the math curriculum discussion will find well-worth the time reading the sections where Moses recollects his experiences organizing in the early 1960s. Moses recalls all manner of details and communicates something of the profound complexity, incredible risk, and world-making discoveries of that era. For those just interested in learning more about the history of SNCC and radical anti-racism politics, the book is an invaluable read. I would put the text up there with other contributions to the field a practical radical pedagogy; alongside the writings of Myles Horton, Paulo Freire, and others. For those artists invested in the pedagogical turn of conceptualism, there is something especially intriguing about how Moses describes the methodologies of the Alegebra Project. I wish all those folks slavishly following Ranciere would give this book their time. It has something very important to say about conceptual practice, the scene of learning, poetics, and political struggle. While the book is absolutely a useful and important resource for those people located in the discussions around radical teaching, the text's concentrated focus makes some curious omissions. For one thing, Moses hardly makes any mention of the political conditions surrounding education. Given the years the book was written, there is no engagement with the Federal policy of the time which, under Clinton, was laying the groundwork for the neoliberalization of public education. At the same time, I am completely sympathetic that for poor Americans, Clinton austerity was just another name for Nixon austerity, Ford austerity, Carter austerity, and Reagan austerity, etc. But the absence of a rigorous engagement with the structural (beyond moral) causes of education injustice highlights a more significant point made in the book. Near the end, Moses comments that unlike the work of SNCC in the south during the 1960s, at the time this book was written, no such larger national project of liberation existed. One of the effects of that absence is a political foundation for the Algebra Project which lacks the same specificity of the Freedom Schools and the Citizenship Schools. WIthout a basic commitment to an anti-capitalist politics or an anti-imperialist politics, the Algebra Projects appears to move dangerously close to a particular kind of "uplift politics" that fails to analyze class politics in America and the catastrophic consequences of a universalized middle class. By 2001, the failure of Clinton-era neoliberalism was well-perceived launching numerous movements of the poor in the US and globally. However, the Algebra Project as represented in "Radical Equations" seems largely cut off from those developments. But I don't want these reflections to in any way diminish the importance or relevance of the book. In fact, it would make an excellent companion to the growing literature critiquing education neoliberalization (not to mention global movements of protest and organizing), providing a very useful concrete discussion and example of how a radical pedagogy might work even in an area of core curriculum like mathematics. Definitely recommended reading! Many people talk about education as a civil rights issue, but before I read Radical Equations I had never seen anyone apply the strategies of the civil rights movement to education. Civil rights leader Bob Moses reflects on his experience organizing African Americans in Mississippi to register to vote in the 1960s and applies the lessons he learned to his work increasing math literacy among students of color. Moses is convinced that approaching education reform from the perspective of a community organizer and emphasizing building consensus, creating personal connections, and empowering people can bring about real change. I was struck by Moses' point that just like people could no longer say that poor black sharecroppers were apathetic when they demanded to vote, young people have to demand a good education to prove to society that they want to learn. I was impressed by Moses' success linking math to everyday experiences, helping young people find their voice, and inspiring youth to teach each other.While I loved the ideas in Radical Equations, unfortunately I was not as impressed with the writing. As heretical as it seems for me to criticize a civil rights icon, I thought the book was sometimes hard to follow and included too many non-crucial details. Still, for me the book was worth reading and I want to remember Moses' words when working with students at Roosevelt. Thanks Laura for giving me this book -- I never would have known about it otherwise. I've read this book many times now, but this was the first time in four years. Moses's recounting of his contributions to the 1960s civil rights movement is characteristically understated, and profoundly moving. His work helping contemporary students demand college-preparatory mathematics inspiring. I think the only real weakness of this book is that it doesn't offer a robust enough defense for the importance of math education in the 21st century. He is right that math opens doors and enables entry into colleges and careers that would otherwise be closed to students. But that is only half the story. We live in a world where the public is preyed upon by entities that seek out the innumerate and take advantage of their weakness. These entities range from the obvious, like lotteries and the gaming industry, to the the nefarious: payday lenders, credit cards, banks, drug vendors, and politicians. Despite the omission of this critical aspect of math education, as a defense from these predators, Moses's expertise as a grassroots activist makes him a uniquely qualified guide to the goal of inculcating in students the desire to learn math. I learn more from this book every time I read it. I love Bob Moses! This year the class I taught was named for him and so I figured I should actually read his book instead of just reading about him. It did not disappoint. He describes his experiences doing voter registration during the Civil Rights Movement, which in and of itself is fascinating to read. Then he goes on to connect this to his current work, the Algebra Project. His theory is that math literacy is the civil rights issue that will make the difference nowadays and is an access issue as crucial as voting rights. He has a point (although I also am a big fan of literacy literacy, and voting rights, still). His description of how the Algebra Project works was interesting, especially his dedication to involving and listening to young people throughout every level of the project. It's hard to rate this with a five star system as it's one thing to rate the style and another to rate the content. I rate this as high as I did because the work Bob Moses has done with the Algebra Project, and the work he has inspired, needs to find a place in every educator's bookshelf. The first half of the book discusses his work in the South as a voting rights activist. He is inspired by the work of Ella Baker, and his story follows hers in that neither Bob nor Ella have the national profile they really should, considering the work they've done. What I appreciate about this book, and the work of the Algebra Project, is that it is not solely informed by charismatic leaders and it really puts tools in the hands of our youth. Access to algebra as a civil rights issue. A good reminder of the inequity of education in this country. I enjoyed both the civil rights portion and the Algebra Project portions of the book. Somehow, the civil rights memoir was from a perspective I have not read before~ someone on the ground in MS in 1962, but not someone whose story has been mythologized beyond humanness. This perspective made the events more real and more personal.Then, the mathematics part ~ very inspiring. What the Algebra Project provided is what communities need, but can institutions deliver it? And do we get caught in the treadmill of standardized testing, which really risks losing more kids to the STEM disciplines? Bob Moses has brilliant ideas of how to improve the school systems: his Algebra project. School curriculum must change with the times and the study of math needs to be addressed. In his book it seemed like no one liked math, the school board, the principles, teachers, parents or students but everyone recognized the importance of its place in academia. As I am working with students who struggle with math I will use his ideas to teach them difficult mathematical concepts. Overall Bob Moses' work in civil rights is pure genius, as an older, retired activists he is taking his passion of civil rights to the public school system. Bob Moses is a role model for all. Bob Moses sets forth the theory that math literacy is the Civil Rights issue of the 21st Century. One of the things I really loved about this book, is how Moses grounds education, and constantly references Ella Baker. It's clear how much he respected, admired, and learned from her. As someone who also admires Ella Baker immensely, I feel so happy and proud to see her appreciated by others - especially leaders in the movement.Moses makes a good point, that math literacy is an access issue. Not having an understanding of basic math can barr students from opportunities for good jobs and educational opportunities. This is a MUST READ for any educator, parent or anyone concerned about civil rights and education. This book explores the relationship between math literacy and access to full participation in civic life and the understanding of how to manage one's own. He makes a compelling argument for Algebra being a "gatekeeper" subject and math literacy being the civil rights issue of the 21st century. He draws on this own experiences as a community organizer in Mississippi in the 1960's and his work on the Algebra Project today. Inspiring to me! 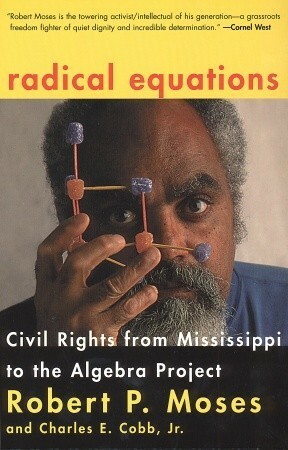 Civil rights pioneer wrote this book illustrating his journey from civil rights activist to math activist. He sees the disinterest in math education as creating a new generation of "sharecroppers" and has founded the Algebra Project to combat this.The book spends a lot of time in Mississippi talking about Moses' civil rights days. I was looking for more information about the Algebra Project and lost interest in the book. I might pick it up again later. I had some trouble staying engaged through the details of the civil rights movement in the first few chapters, but once I got to chapter 4 where he started talking about the algebra project I really enjoyed it. As a teacher it was encouraging to see the grassroots work that has begun regarding understanding and making connections to algebra. I recommend this for any educator or parent who is struggling to teach algebra it will inspire and motivate you to teach. i had to read this book four times before i finally understood it, but now i think i do.Bob Moses is my hero, for the work he did in the Civil Rights Movement (he was behind Mississippi freedom summer) as well as the work he is doing now with math literacy in inner-city schools.The book is broken up in two parts, which tell the story of those two aspects of his life. I read this book as part of an Equity Reading group. Not one of my favorite subjects (mathematics) as a school leader I needed to broaden my understanding of Algebra as a "gatekeeper" for college and career readiness. Especially as it pertains to students of color. I was enlightened and given a better base for a belief in Algebra for all at the middle school level. I liked the book because of the content. Some nice background history from an inside source on the civil rights movement, and a pretty interesting story about the growth of the algebra project. I wish the author had gone deeper into the project, he seemed more interested in the big picture rather than the details. Such a cool project! This is the book that first got me thinking about teaching math. Baltimore has a chapter of the algebra project and I am trying to convince my school to get the project going in our school. fascinating paralells between the civil rights movement and current access to education that will allow people to participate in the economy as knowledge workers. a bit more about process of building the program than content, but still quite interesting. Read for a class. Good points, but IMHO would have made a much better journal/magazine article than book. Still, if you're interested in knowing the ins-and-outs-and-hows of civil rights organizing in the 1960's, you might be interested in the first three chapters. One of the great minds and spirits of the modern civil rights movement has masterfully linked math literacy to the definition of citizenship and freedom in the 21st century. Math literacy really is the gatekeeper to success. Moses makes a very good argument for it being the civil rights movement of this century. I wish this is how my math experience had gone. Brilliant idea. Knowledge of mathematics is as much a civil right as suffrage. I confess, I never actually finished this. I had to return it to the UPenn library so I could receive my degree... I wish I had time to finish it, though! Math literacy... here we go! Just beginning this one, it's Robert Moses' story of organizing young students of color around algebra. Books Related with Radical Equations: Civil Rights from Mississippi to the Algebra Project by Robert P. Moses Charles E. Cobb Jr.